Compact SUV's provide drivers with the best of both worlds which is one of the main reasons they are more popular now than ever. They are highly capable vehicles that offer a variety of features that will meet a wide range of needs among consumers. 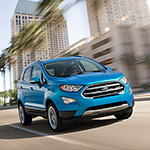 That is why our team of SUV experts at Korum Automotive Group are so excited to tell you all about the brand new 2019 Ford EcoSport! First, drivers will love the auto stop and start technology which allows you to conserve fuel which saves you money. It works by shutting off the engine to save fuel at places such as stop lights or when you're stuck in traffic. Additionally, drivers will love the intelligent four-wheel drive system in this vehicle. This system provide some of the best handling on the road whether you're out for a Sunday joyride or driving in harsh weather.